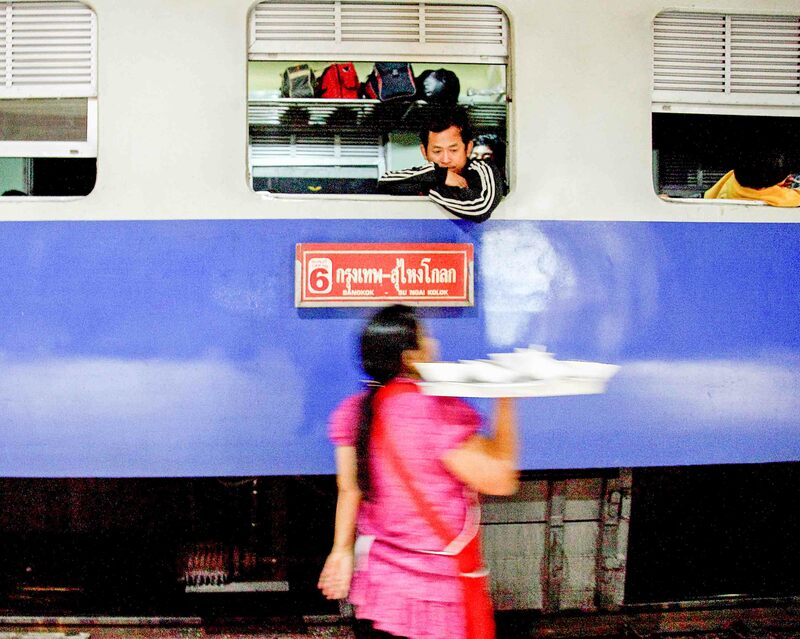 The kingdom of rails: Is the best way to see Thailand by train? Train travel. 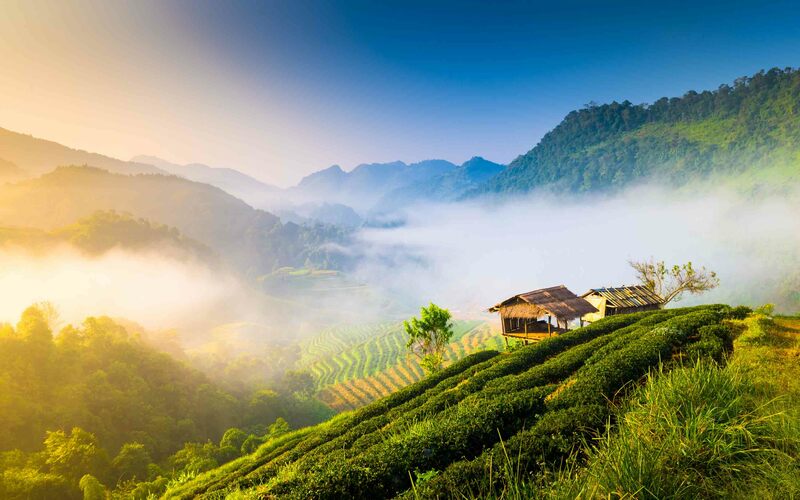 Suspended in the rocking belly of the iron beast, with Thailand scrolling past your window—bridges, backyards, paddies, hills and the clang of level-crossing bells—there’s nothing quite like it, says veteran travel writer John Borthwick. 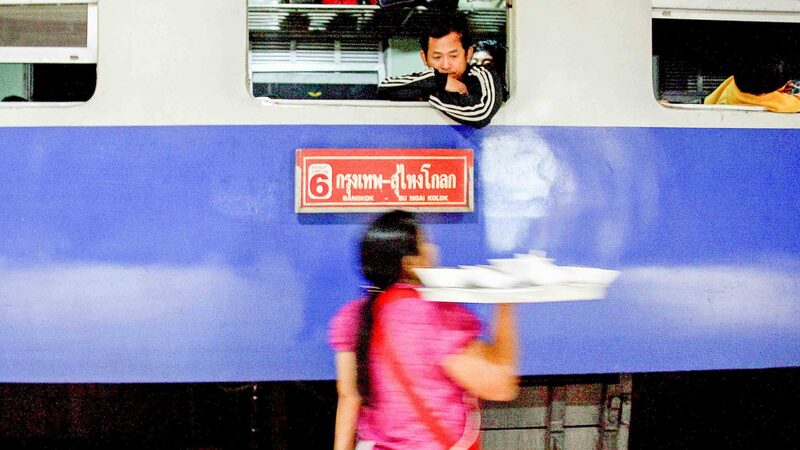 It all starts at Bangkok’s Hua Lamphong terminus, the heart of a rail web stretching from Nong Khai to Hat Yai. 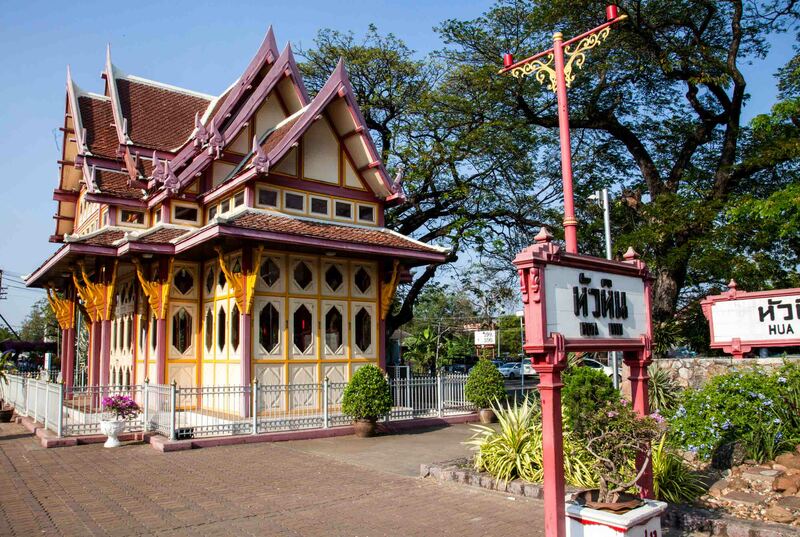 A throwback to the glory days of rail travel (it was built in 1916 by King Rama V, the monarch credited with protecting Thailand from colonization), this grand old dowager with its vaulted roof gives any journey a ceremonial sense of departure. 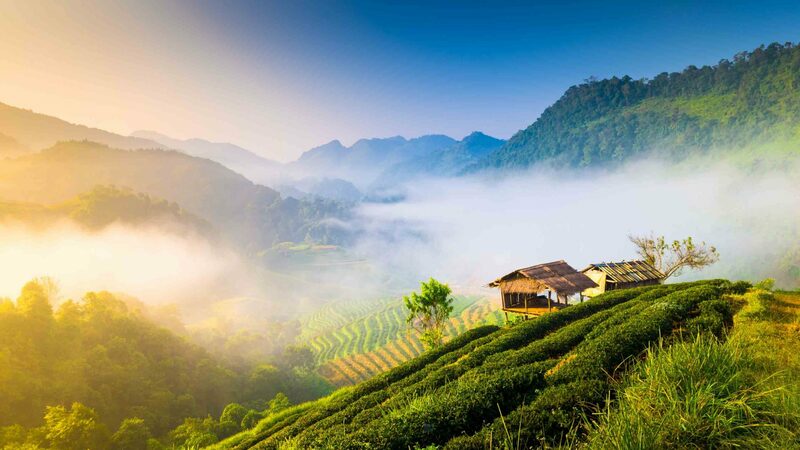 The night express to Chiang Mai is the classic Thailand rail trip. I board it for the 750-kilometer (465-mile) journey, ready to rock (quite literally) on Thailand’s narrow, one-meter gauge tracks. I’ve booked a four-berth compartment with upper and lower bunks in the popular, air-conditioned second class. The carriages (ex-Japan Rail) are tired but clean. As we rumble north through Lopburi and Nakhon Sawan, I stretch out on the bunk with railroad songs humming through my head—think Mystery Train, Love In Vain, Spirit of New Orleans—and fall asleep to the heavy metal lullaby of steel wheels on rackety rails. Come morning and we’re in Lamphun; the blue ranges of northern Thailand rise in the distance and then almost too soon we’re at Chiang Mai—10 minutes early. I look along the platform to see who our train has carried. It could have been called the ‘Farang Express’. 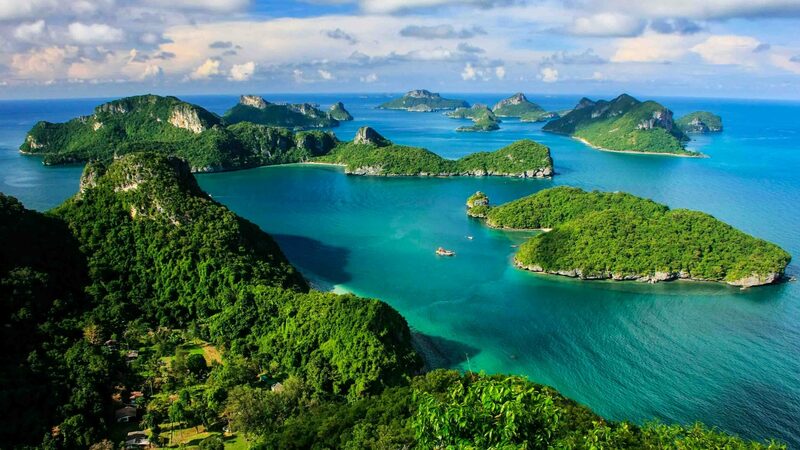 The passengers are predominantly foreigners here, to see ’the real Thailand’ and meet real Thais. Ironically, the Thais seem to have gone by plane or coach. At least the Bangkok-Chiang Mai service ends up in Chiang Mai. Despite its title, the Bangkok-Vientiane service doesn’t make it to Vientiane. It crosses the border bridge across the Mekong but stops 16 kilometers (10 miles) short of the Laos capital. Otherwise, this overnight trip via Nong Khai, Thailand, is superior to its Chiang Mai cousin, having very new carriages, a much better dining car and seats with their own power outlets. 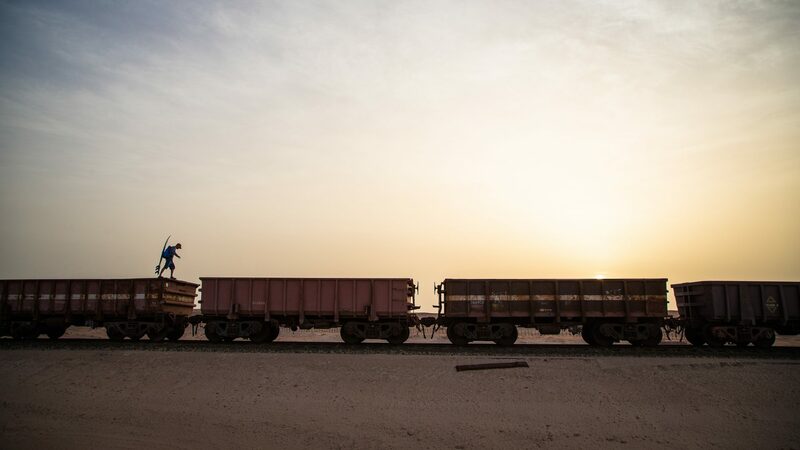 The old wooden sleeper cars of Paul Theroux’s 1970s jaunt from Bangkok to Singapore are long gone but this 2000-kilometer (1250 miles) rail adventure is still there for the taking. The Death Railway wasn’t named lightly. Spare a thought here for those who perished building it during Imperial Japan’s reign—over 80,000 Malay, Burmese and Thai civilian laborers, along with 12,600 Allied prisoners of war. 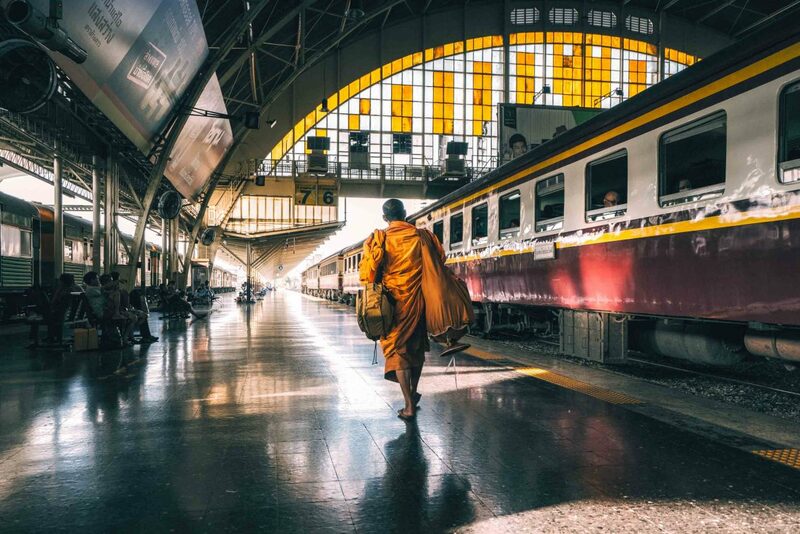 “I have seldom heard a train go by and not wished I was on it,” says train traveler extraordinaire Paul Theroux, who rode the Thai rails twice during his epic, round-the-world train jaunts, as later immortalized in The Great Railway Bazaar (1975) and Ghost Train to the Eastern Star (2008). 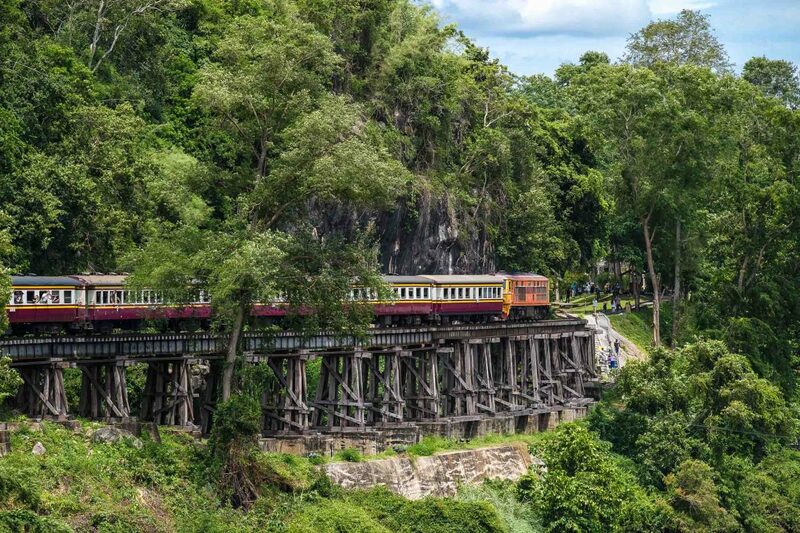 The old wooden sleeper cars of his 1970s jaunt from Bangkok to Singapore are long gone but this 2000-kilometer (1250 miles) rail adventure is still there for the taking. For this is one of the great train journeys of the world, all yours for two days of your time and less than a hundred dollars. However, should a distant uncle will you his secret Bitcoin wallet, lash out on a once-in-a-lifetime rolling romp on the Eastern & Oriental Express. 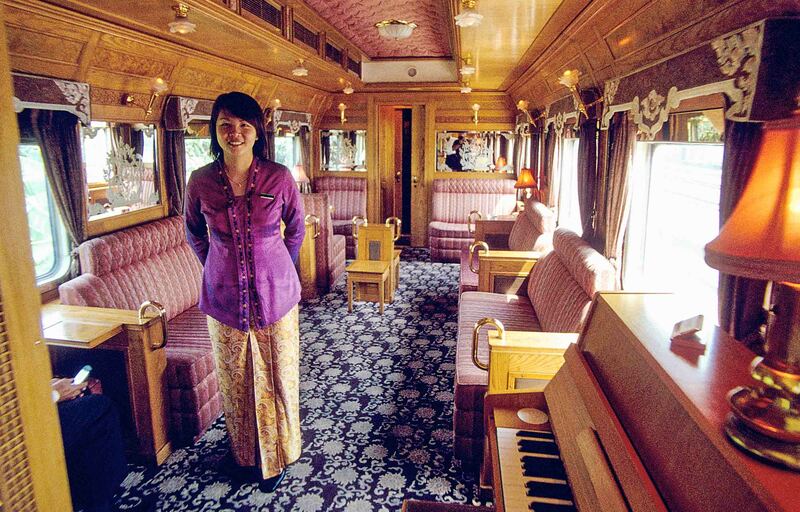 This private Bangkok to Singapore special is a rolling work of art—the rosewood and elm marquetry alone is worthy of a museum spot—and then there’s its unique caboose with a view. 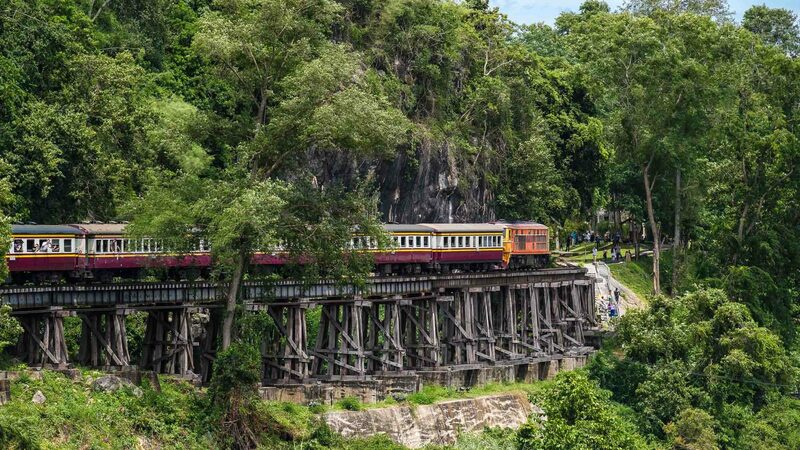 True, the E&O Express is a heinously expensive, post-colonial bubble—retro-Rajing, so to speak—but to stand on its open-air, last car viewing platform and watch Thailand slip away behind you, green and templed, jungle or riverside, is one of the most beautiful perspectives anywhere in the kingdom of rails. 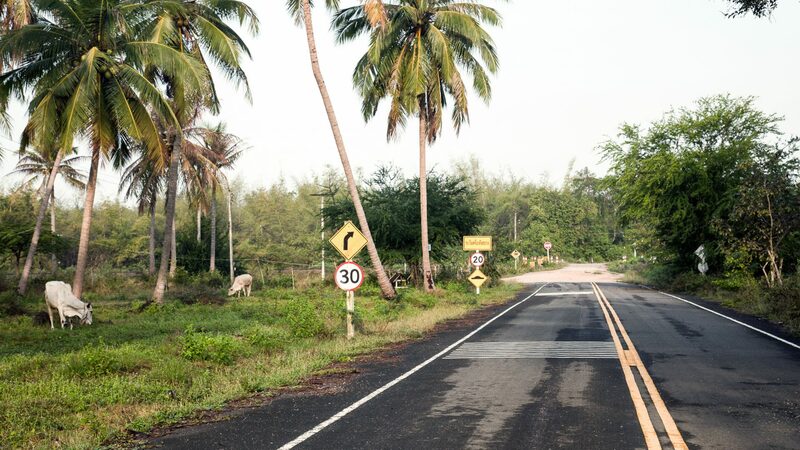 Whichever rattler you ride south, you’ll pass through Hua Hin, 200 kilometers (125 miles) from Bangkok. 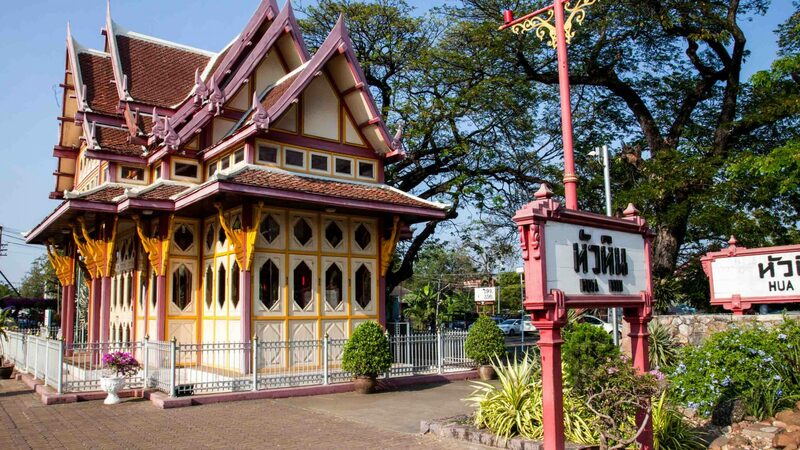 In the 1920s when the railway was first pushed through to British Malaya, Hua Hin’s two most important structures were its station and the Railway Hotel. While your train is at the platform here, check out the historic Royal Waiting Room, which looks like a cross between a Buddhist temple and a superior ticket office. The morning train, a two-carriage electric service, arrives with a horn blast. Hawkers rush to pull back their awnings, with only seconds to spare. The market parts before the train, like the Red Sea before Moses. Thereafter, your journey down the peninsula flickers by in a daydream. Kids wave, bells clang, jungles crowd the line, and flagmen and signals recede to infinity. The international border comes and goes, as does Kuala Lumpur station, an onion-domed fantasy suggesting Thomas the Tank Engine Goes to Mecca. (Reassuringly, the station roof can also support three feet of snow.) Seven more hours and the vertical kampongs of Singapore loom into view like another planet. Meanwhile back in Thailand, try the country’s shortest rail line. 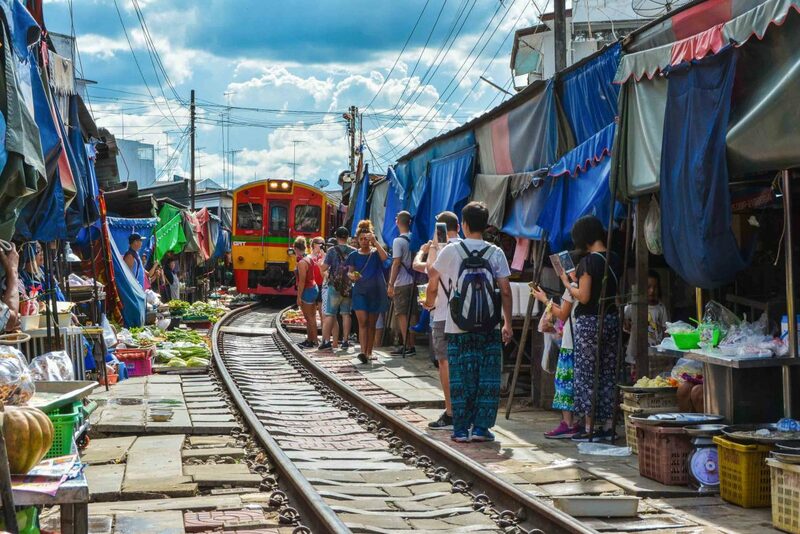 The 67-kilometer (40-mile) Mae Khlong Railway, between Bangkok’s Wong Wian Yai and Samut Songkhram, terminates amid the melee of a local market. Thais call it Talad Rohm Hoop, “umbrella pull down market,” but foreigners know it better as the Risky Market. The tracks run through the middle of the market stalls and are completely overhung by canvas shade awnings. The morning train, a two-carriage electric service, arrives with a horn blast. Hawkers rush to pull back their awnings, with only seconds to spare. The market parts before the train, like the Red Sea before Moses. My Thai buddy hauls me backwards, saying, “The train got no wrong.” Understood! I fling myself against a wall, flat as a pressed duck, as the train rumbles by, inches from my face. Risky marketing, indeed. 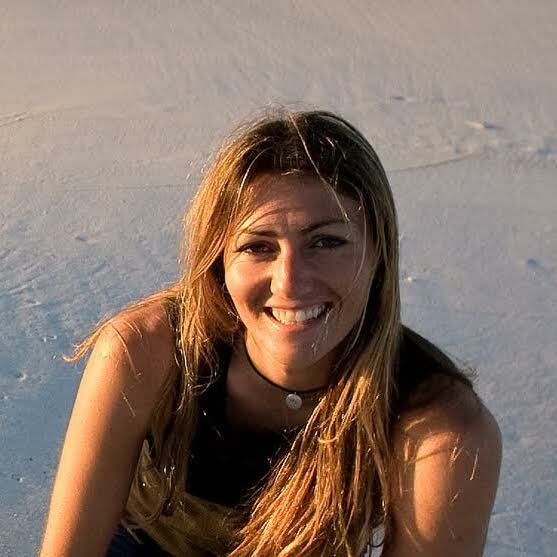 – Traveling around Thailand by rail is economical. Also wise, given the country’s appalling road death toll. – Reserve your seat in advance especially if traveling near public holidays; for ease (and a small fee), book through an agent. – Go for the slightly more expensive lower bunk; the upper is narrower and, being near the A/C vent, colder. 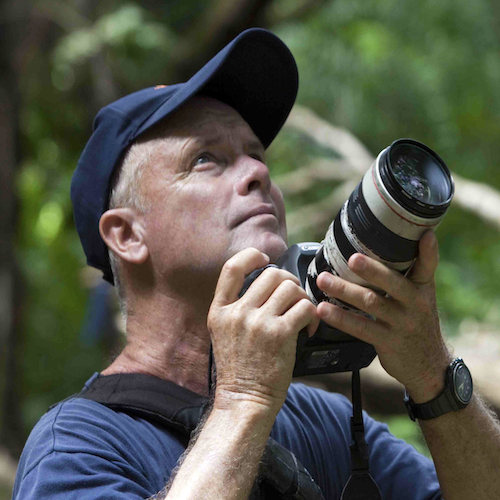 One of Australia’s leading travel writers, John Borthwick's work appears in The Weekend Australian, Fairfax Traveller and many others—all of which keeps him too long away from surfing good waves or hiking some gob-smacking coastline. 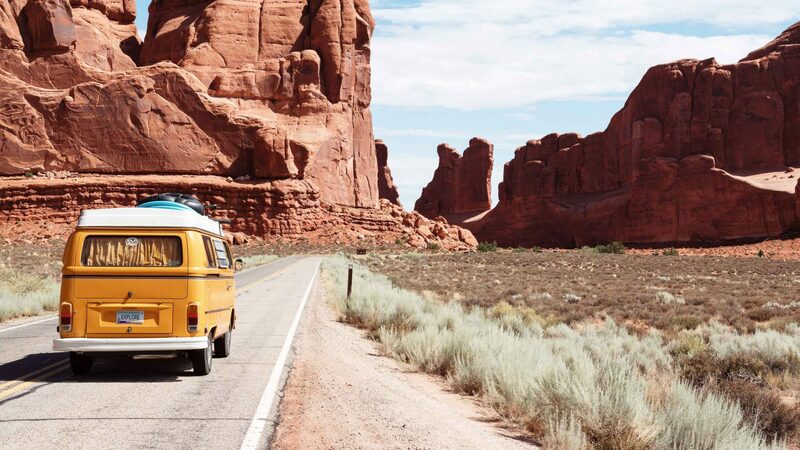 Turn and face the strain: How has travel changed since the ’70s?